With a live countdown display in the product! "Encourage your customers to buy with attractive prices in predefined time periods." In retail shops a common case: offers of the week, seasonal sales, sellouts and many more timed discounts. With Discountdown you'll get that in your online shop as well, just easier. Set your discount price beforehand, select a start and end date, we'll care for the rest. That way you can plan your sales in advance! One more thing: we'll add a prominent countdown to your product page, drawing attention to the discount and making undecided visitors real customers. After installing the app and registering on our site, you'll get access to Discountdown. Click"New" above the countdown list or the link"Products" on the top of the page. Select the product you want to give discount on. 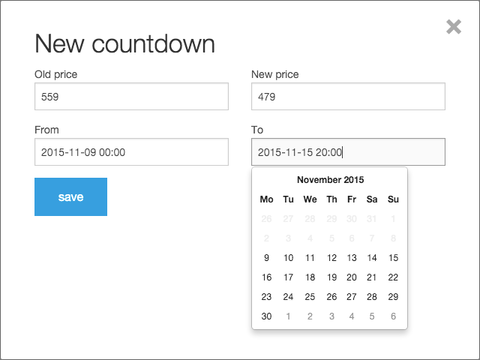 Create a countdowns with the rebate price, select the date and time for start and end of your sale. 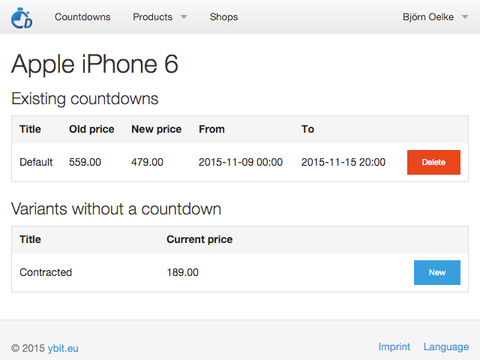 Within this time period we activate the discount price in your shop and create the live countdown. 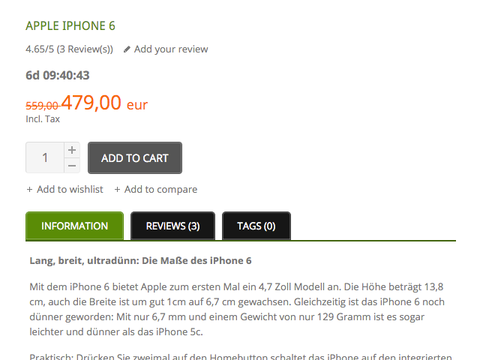 When it expires we reset the product's price to the regular one, completely automatic. Of course you can cancel countdowns early, in that case we set product's price to the regular price and remove the countdown. We're working with Lightspeed since late 2014 in areas like connecting our customers' ERP systems to Lightspeed and producing apps, like Discountdown being our second one after Pricen, a price configurator. Furthermore we've specialized in Bitcoins, Freifunk, data privacy and green IT. 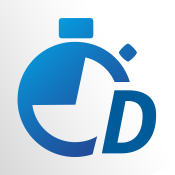 Feel free to contact us if there are questions, you're having problems or great ideas how to make Discountdown better.